Now that we're consistently having warmer weather, it's time to talk about one of my favorite fabrics, seersucker! 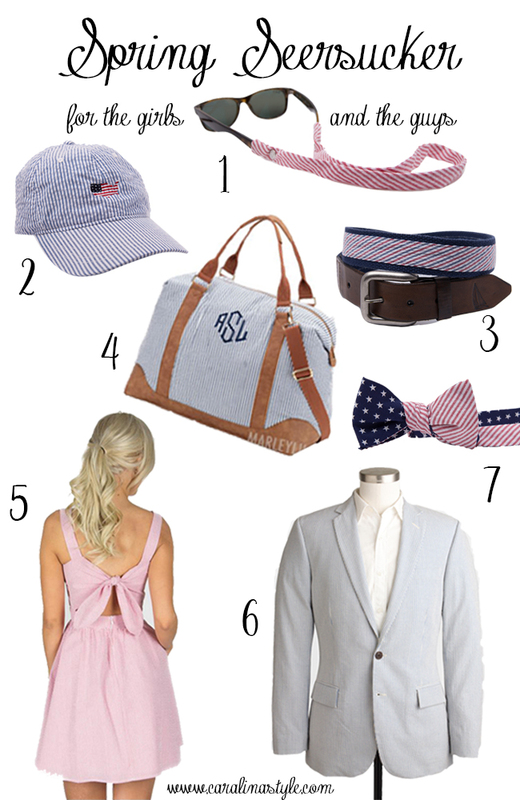 Who doesn't love a little seersucker for spring and summer? You don't really have to iron it, making it great for travel, it's nice and light for warm weather, and it's just a classic that I have always loved. Which you can clearly tell from previous posts like my Carolina Cup post, this blue seersucker outfit post and the several Instagram posts in the same dresses. Today I'm sharing some great seersucker pieces for girls and guys, including several products from Port Royal Outfitters. There will be another post coming up featuring some more of their products! I love me some seersucker!! And you're right, it's great for the guys too! Oh my goodness, all of these pieces are gorgeous! I love that Lauren James dress and the duffle bag is so stinking cute!